Skinner Lodge is a journey into our retirement years. We’re not there yet, but this journey started in 2006 when my soon to be husband and I set goals for our future. At first it was just going to be a place to get away. A place for family and friends to visit and relax. Then as the recession hit us, I was close to losing my home and his business which was based on state contracts were drying up fast. Reality was setting in. Here we were in our mid-life years, we had just found each each other and our worlds were falling apart. We decided that if we pooled our resources, minimized to the bare necessities and learned to become much more self-sufficient we could develop a rich and meaningful new lifestyle. 10 acres with cabin. Close to state land. Land contract terms. A 12X24 cabin in northern Michigan on 10 acres. The advertisement shouted, “Land Contract, Low Down Payment”. I’m intrigued. “Let’s look” I say. “No, too small, not what I’m looking for”, he replies. The picture looked like a shed dropped in a bulldozed clearing along a road somewhere. We had seen it many times over several months advertised in realty magazines, but my partner just wasn’t interested. It wasn’t until we spent a day at a “Home and Garden” show and visited a vendor who was a realtor and pulled us in to chat. He had goodies to offer as they usually do at these shows. “How about a pencil, or a pad to take notes.” We explained that we had casually been looking for a place and of course, he had a listing he wanted to show us. Low and behold it was the small cabin we had seen. 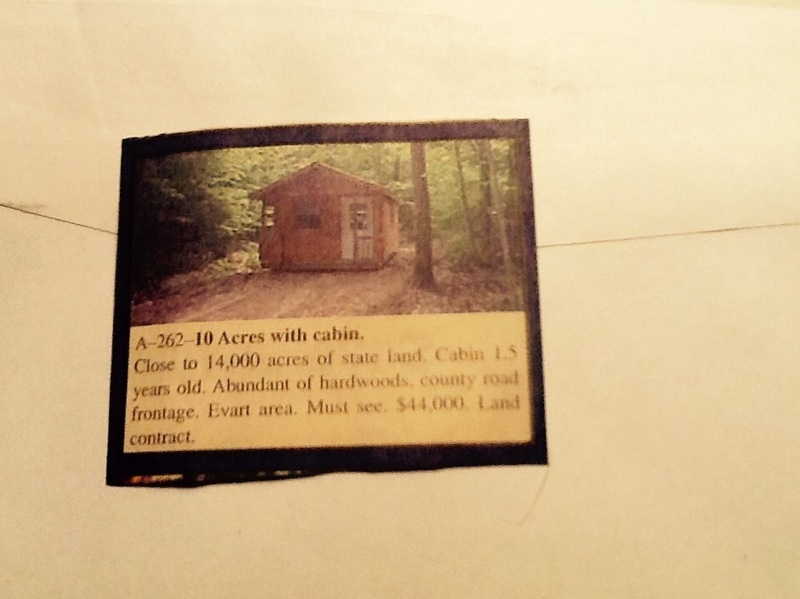 He explained the details and directed us to check out 2 cabins located on a split 20 acre parcel. We didn’t act on this information immediately because my partner already knew he didn’t like it. We waited a few weeks before we went to look. Money was tight, but we decided to make the journey that would take us 2 hours northward. When we got there the agent was showing one of the cabins to another couple and directed us to check out the one on the next parcel over. So we walked through the woods about an acre or so to the east. It was a brand new, “amish” built cabin. It had been empty and on the market for well over 18 months. It was small, without a well, septic or electricity. We walked around and I fell in love immediately. My partner wasn’t so sure. He was not too familiar with the area and preferred “flatter” ground. This terrain was rolling, not much flat land here. I had lots of ideas how we could make it work. He was skeptical, he’s always skeptical. He had to analyze everything, take measurements, walk the property. Take more measurements, scratch his head, make mental notes and drive me crazy (that has become his job). So, we walked and talked and came back another time. We talked some more and he brought his son back to see it, and we talked and started to put some money together. We then finally contacted the agent and started the purchasing process. I was elated. He was concerned. We finally closed on the property in June of 2007. And so the journey began. Skinner Lodge was purchased and The Rollin’ Rock was born. Image | This entry was posted in conservative approach and tagged amish built cabin, journey, woods. Bookmark the permalink. Great story! Hope to hear more in the future.